The eastern chipmunk (Tamias striatus), is a member of the squirrel family and is common throughout Indiana and the eastern United States. Chipmunks are usually found in mature woodlands and woodlot edges, but they also inhabit areas in and around suburban and rural homes such as around ornamental plantings, rockpiles, outbuildings and below patios and building foundations. Although they are mostly burrowing rodents, they regularly climb oak trees in the fall to gather acorns. Around residences, they sometimes use downspouts and overhanging trees to gain access to rooftops. Most people enjoy watching chipmunks. They are cute little mammals whose antics often make us laugh. They are also a part of the food chain in the wildlife community. Chipmunks prey upon various insects, and the chipmunks themselves serve as prey for various predators. Moreover, their food habits influence the growth of various plants. But chipmunks can also be serious destructive pests when they become numerous around homes and gardens. The burrowing activity of chipmunks can cause significant structural damage by undermining foundations, concrete patios and steps, retaining walls and sidewalks. They may also be destructive to gardens when they dig up and eat bulbs and seeds or attack garden fruits. The eastern chipmunk is a small brownish grounddwelling squirrel 5-6 inches long, with two pale and five blackish longitudinal stripes on its back, and two pale and two brownish stripes on each side of the face. The rump is reddish brown; the tail is 3-4 inches long and is hairy. Chipmunks normally weigh 2 and 4 ounces. Sometimes the chipmunk is confused with another ground squirrel, the thirteen-lined ground squirrel (also called “striped gopher”). The thirteen-lined ground squirrel is yellowish, lacks the facial stripes, and the tail is not as bushy as the chipmunk’s. And, as this squirrel’s name implies, it possesses 13 stripes extending from the shoulder to the tail on each side and back. When startled a ground squirrel carries the tail horizontally along the ground; the chipmunk carries the tail upright. Brownish, stripes range in pale, black, and brown. The diet of chipmunks consists of various kinds of nuts, berries and seeds, but they also eat mushrooms, insects and carrion. Chipmunks cache food in their burrows throughout the year. The burrows of chipmunks often are well-hidden near buildings (such as basements and garages), gardens, stumps, woodpiles or brushpiles. The burrow entrance is usually about 2 inches in diameter. There are no obvious mounds around the burrow entrance because the chipmunk carries the dirt in its cheek pouches and scatters it on the ground away from the burrow to make the burrow entrance less conspicuous. In most cases, the chipmunk’s main tunnel is between 20 and 30 feet in length, but complex burrow systems occur where cover is sparse. Burrow systems normally include a nesting chamber, one or two food storage chambers, various side pockets connecting to the main tunnel, and separate escape tunnels. Chipmunks are generally solitary and protect their territories except during courtship, or when the young are developing. Mating occurs two times a year: during early spring and again during the summer or early fall. There is a 31 day gestation period. Two to five young are born in the spring (e.g., early May ) and during August – October. The young are sexually mature within one year. Adults may live for up to three years. Young appear for the first time above ground when they are 2/3 full size. The average territory of a chipmunk is about 1/4 to 1/2 acre, but the adult usually only defends an area about fifty feet around the burrow entrance. Chipmunks are most active during the early morning and late afternoon. 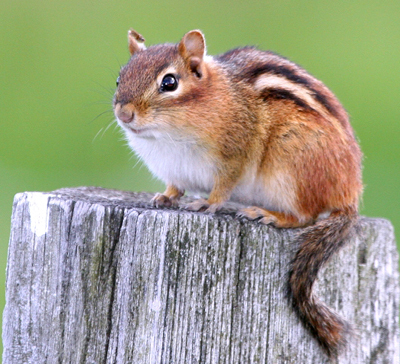 Populations of chipmunks average between 2 and 4 animals per acre. The home ranges often overlap among the individuals. However, populations as high as 10 chipmunks per acre are possible if sufficient food and cover are available. With the onset of cold weather, chipmunks enter a restless hibernation during late fall or early winter and are relatively inactive during the winter months. Some individuals, however, are occasionally active on warm, sunny days during the winter. Most chipmunks have emerged from hibernation by early March. Wherever possible, chipmunks should be excluded from buildings. Hardware cloth, caulking, or other appropriate materials should be used to close openings where they may gain entry. Trapping is the most practical method of eliminating chipmunks in most homeowner situations. Either livecatch wire-mesh traps, or common rat snap traps can be used to catch chipmunks. Effective baits for live-catching chipmunks include nutmeats, pumpkin or sunflower seeds, raisins, prune slices, or almost any of the common breakfast cereal grains. Place the trap along the pathways where chipmunks have been seen frequently. The trap should be securely placed so there is no movement of the trap when the animal enters. Trap movement may prematurely set off the trap and scare the chipmunk away. A helpful tip is to “pre-bait” the trap for 2-3 days by wiring the trap doors open. This will condition the chipmunk to associate the “new metal object” in its territory with the “new free food source”. When the chipmunk is actively feeding on the bait in and around the trap, set the trap. Live-catch traps can be purchased from local hardware stores, or rented from local animal shelters. Traps should be checked frequently to remove captured chipmunks. Release any unwanted animals caught in live traps. Avoid direct contact with trapped chipmunks. Live captured chipmunks may be transported and released several miles from point of capture with written permission of the land owner. Common rat snap-traps can also be used to dispose of nuisance chipmunks. The same baits used for live traps can be used for snap-traps, but they should be tied to the trap trigger. Another excellent bait is peanut butter smeared on the bottom of the trigger. As with the live traps, it is best to pre-bait the traps by not setting the trap until the animal has been conditioned to steal the baits safely for 2-3 days. Small amounts of extra bait may be placed around the traps to make them more attractive. Set the snap-traps perpendicular to the chipmunk’s pathway or in pairs along the travel routes with the triggers facing away from each other. Set the trigger arm so that the trigger is sensitive and easily sprung. Traps can be placed underneath cardboard boxes with 2″ diameter holes cut into their ends to protect birds from interacting with the traps. If snap-traps cannot be isolated from children, pets or wildlife, use live-catch traps. Where shooting is legal, use a small-gauge shotgun or a .22 caliber rifle with bird shot or C.B. cap loads. Chipmunks are nervous and alert, so they make difficult targets. The best time to attempt shooting is on bright sunny days during the early morning. There are no poison baits commercially available to the homeowner to kill chipmunks. Baits which are used against rats and mice in and around homes will also kill chipmunks, although they are not labeled for such use and can not be recommended. Moreover, chipmunks that die from consuming a toxic bait inside structures may create an odor problem for several days.